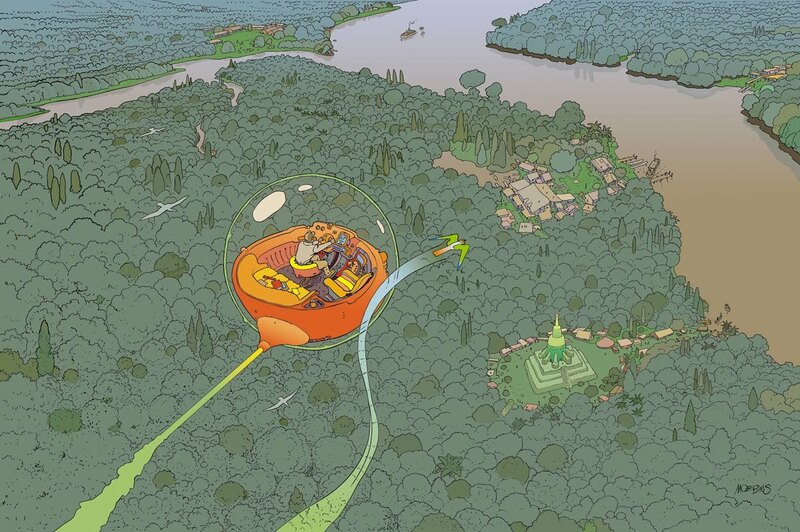 Moebius art from ‘Voyage d’ Hermes’. A few years ago, I gave up role playing games after getting burnt out specifically on the fantasy genre. But my enthusiasm for RPGs has been reinvigorated recently thanks to a newly released game called Numenera which first caught my attention after io9 did an article on the game. What really grabbed my interest was that the setting was in the far, far future on Earth, and it wasn’t anything like what you might expect. It’s far away from Star Wars or the Matrix. The game is a bit like a fantasy setting with the discovery of technology from the past helping characters’ encounters with the weird and bizarre locales and creatures of the Ninth World. It is its own thing, which is a science-fantasy world…”a weird world,” one which has got me inspired to start this website, start writing about Numenera, create an adventure module in the setting, and write about Sci-Fantasy and other related topics. The book is what one might expect from Monte Cook, who was one of the architects of D&D 3.0, well written and organized and art that enhances your overall understanding of the world and the mechanics behind it, which are the most simplified rules that I’ve ever come across coming from a player with a Pathfinder/Dungeons & Dragons 3.0 background. One of the big factors for me in considering Numenera was its influences. Cook names French artist Moebius as an inspiration for the Ninth World which Numenera takes place on. If you can’t tell already by the huge banner on the site and the story summary graphic on this post, I’m a huge Moebius fan. I consider him one of the greatest artists ever. So it wasn’t a question for me if I wanted to play a Moebius-inspired RPG. My big project for the website is to create an adventure module in Numenera based in the kingdom of Iscobal called “The Paranoid Automaton.” I figure I’ll do do my research based of course on Numenera, Planescape, The Slumbering Tsar and other influences. I’ll release more information soon and will consider running an online game or play-by-post game based on the adventure. I’m glad a game like Numenera’s come along and can’t wait to see where it takes me.